After designing my Big Bold Cabled Ponytail / Messy Bun hat, I decided I wanted to design a simpler one using the popular linen stitch pattern. 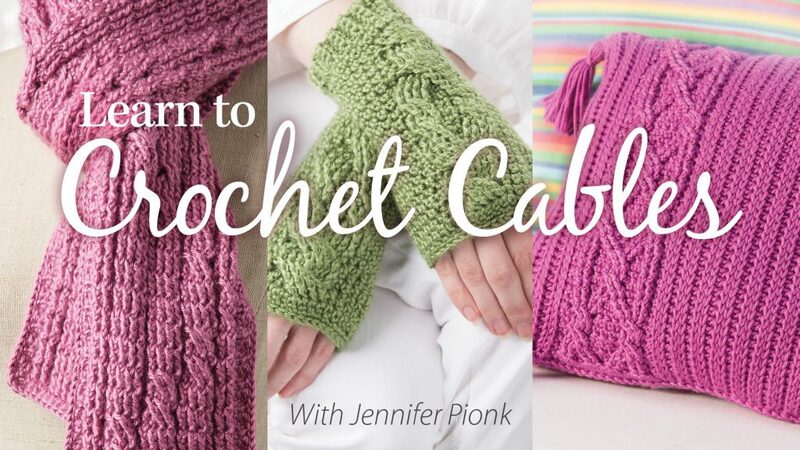 You can use a number of other stitch patterns that have a multiple of 2 or 4, if you prefer (you will just have to modify the crown shaping rows when you get to them). Row 2: Ch 1, BLO sc in each st across. Turn. Band Seam: Bring Row 1 to meet the last row, ch 1, (sl st BLO of last row to BLO of 1st row) repeat across. (4, 6, 6, 8, 8 sts) Turn band inside out. Continue on to Body of Hat. TIP for Row 1: Count how many rows you worked for the band. Subtract that number from the number of sts you need to work in Rnd 1. This number is the number of increases you need to work around your band. Example: I’m making the adult med/lg and my band has 68 rows & at the end of Rnd 1 I need to have 76 sts. So for my math I have 76 sts – 68 rows = 8 increases for Rnd 1. For Rnd 1 I need to work 8 increases of 2 sc in side of next row to increase to 76 sts. Rnd 3: Ch 2 (counts as 1st st and 1st ch-1), skip 1st sc, sc in next ch-1 sp, (ch 1, skip next sc, sc in next ch-1 sp) repeat around. Join w/ a sl st to the 1st ch of the rnd. Rnd 4: Ch 1, sc in first ch-1 sp, ch 1, skip next sc, (sc in next ch-1 sp, ch 1, skip next sc) repeat around. Join w/ a sl st to 1st sc. 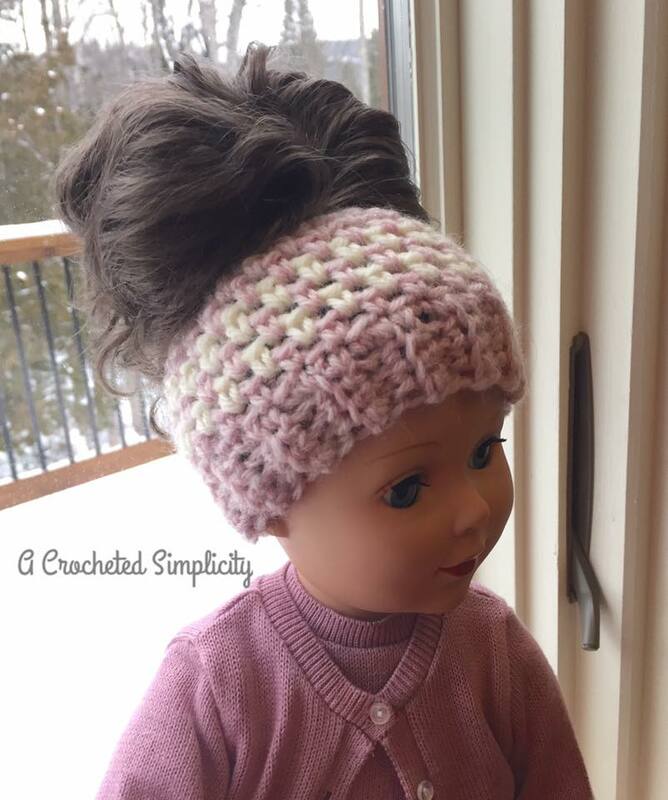 18″ Doll: Rep Rnds 3 – 4 (ending w/ a rep of rnd 3) until hat measures 2-1/4” then continue to Crown Shaping Doll. Toddler: Rep Rnds 3 – 4 (ending w/ a rep of rnd 3) until hat measures 5-1/4” then continue to Crown Shaping Toddler. Child: Rep Rnds 3 – 4 (ending w/ a rep of rnd 3) until hat measures 5-3/4” then continue to Crown Shaping Child. Teen / Adult Small: Rep Rnds 3 – 4 (ending w/ a rep of rnd 3) until hat measures 6-1/2″ then continue to Crown Shaping Teen/Adult Small. Adult Medium / Large: Rep Rnds 3 – 4 (ending w/ a rep of rnd 3) until hat measures 7” then continue to Crown Shaping Adult Medium/Large. Do not fasten off. Continue to Finishing. If you love texture & cables, check out my Big Bold Cabled Ponytail / Messy Bun, Beanie & Slouch Hat! « 3rd Annual Designer Collaboration: Sales Event & Giveaway!!! My daughter just asked for this for Christmas. Thanks! 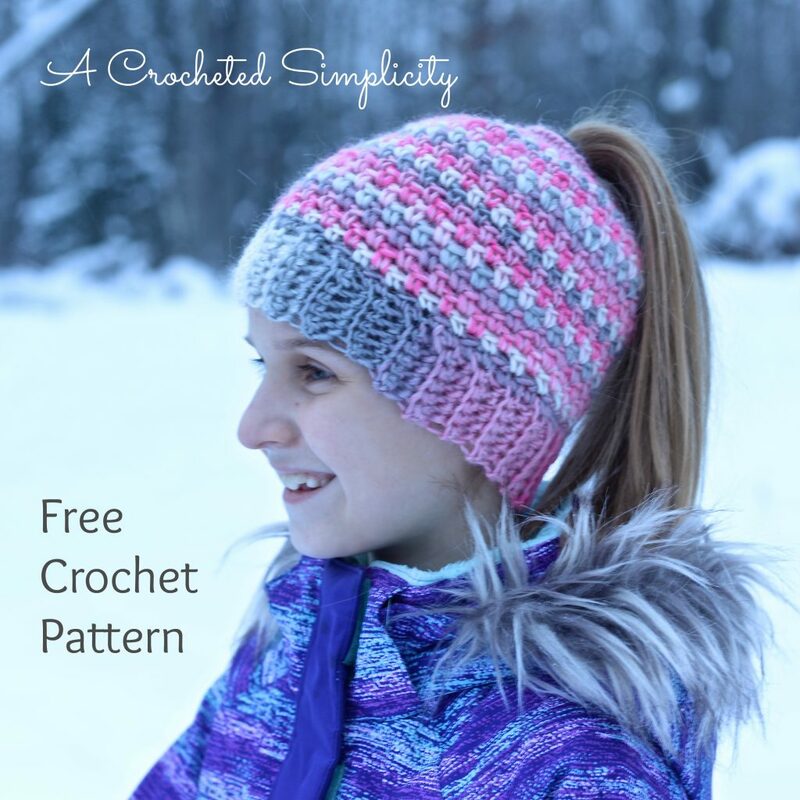 I added it to the round up of free patterns as well and can’t wait to work this one up! I love this pattern, but, the only question I have is, what does BLO stand for? I will be making a few of these. I just wanted to thank you for making this pattern and offering it for free. I am going to try and make a couple for two little girls. What is the name of the color of yarn that you used for this? going to try pattern ,thank you and keep them coming . I love this pattern and was wondering what is the name of the yarn (color) pictured in the photo? you say i hook or j hook but you dont specify which one to use all i see is J what is the i one for ? When doing the stitches into the band do the chains between the single chains count in the 76 stitches? I’m confused by what you’re referring to as the chains between single chains. Can’t wait to try this pattern, thanks! Do I need 4 skeins of yarn, or just an amount that totals 200-300 yards? I think I am a little confused. Instructions say 17″ for hat in brim and fits 23″ – 24″. I followed them to the letter. The person I made it for says it fits a child. Hi Kim~ What kind of yarn did you use? I used an 100% acrylic yarn which has much more stretch than wool/wool blends. And when you say your band measured 17″, was that unstretched? I’m confused by your math. I ended up with 60 rows for the band. You say to subtract but it looks as though you added. What would my st # be? Hi Dara~ You subtract your Row number from the total number of sts specified for Rnd 1 of your hat. This will tell you how many increases you need to add around your band to get to the correct number of sts for the size you’re working. So, you’re adding sts, but subtracting numbers to figure out how many to add. I just wanted to say thank you for this awesome pattern!! Because of you, i am able to give 3 special little girls a Christmas present!! ??? I am loving this pattern! Thank you so much for posting it! I am currently working on the body of the hat for an adult medium/large and was wondering abut the part that said “until hat measures 7-3/4″ then continue to . . . .” Does the 7-3/4″ include the band of the hat or is the 7-3/4″ just the body of the hat. Again, thanks for this pattern! Thank you for this free pattern. I’m going to add it to my “must make list” to my must make list. I’m having trouble with the start of the crown. Do you have a video showing it? Am confused about how to increase. I need 8 increases for row one. Do I evenly space them ? How do you do the sc2tog? I too had the same problem with the size. I made the child size for a 6 year old…and it’s too small. So i made it again in the teen/ adult small size and it’s still a bit snug. I also made the adult medium/large for a 9 year old and it fits good. It also fits me. I used 100%acrylic. Thank you so much for the pattern! For the crown shaping, should all of the stitches go into the sc-space, not the actual stitches? I’m a little confused by the instructions and just want to make sure I’m doing it correctly. Thank you!! Hi Tasha~ Yes, you’re correct! My adult daughter asked me to make this for her. I am trying a small sample using the doll measurements before I invest in yarn. I am confused by how to work stitches in round 1. Instructions say to work in “sides” of the rows. I don’t get it. 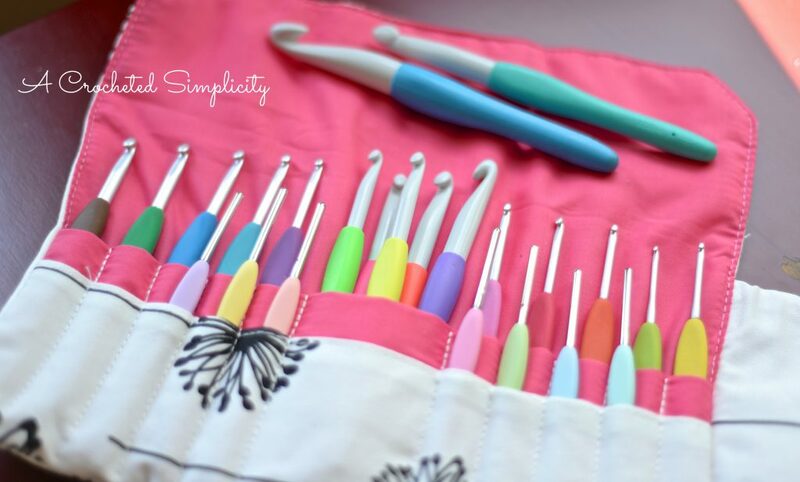 Have watched the tutorial but it is too fast to see where the stitches are being placed. Help!! Just finished it for my daughter (7 yo). The mathematics tho ?. But I like the final result. Thanks for the free pattern. sO I AM STARING TO MAKE THE BODY OF T HE HAT, I AM CONFUSED BY HOW MANY INCREASES I NEED FOR THE TE=EN/CHILD HAT,I HAVE 40 ROWS AROUND THAT EQUAL 17 IN? HOW MANY INCREASES DO I NEED?